Fuchs, M., & Funke, F. (2007). Video Web survey: Results of an experimental comparison with a text-based survey. In M. Trotman et al. (Eds. ): The challenges of a changing world. 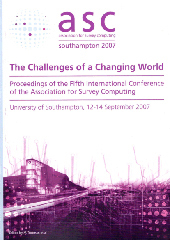 Proceedings of the fifth international conference of the association for survey computing (pp. 63-80). Berkeley: ASC. In recent years Web surveys have been enriched by graphics and pictures – some of which are contentbearing. Methodological evaluations have shown that these pictures can have a serious impact on the perceived question meaning and thus on the responses provided. In this paper we will report preliminary results from an assessment of the next step towards a full audiovisual Web survey. In spring of 2007 we have conducted a field experimental randomized comparison of a traditional text-based Web surveys to a Web survey containing videos of an interviewer reading the questions to the respondents. In the paper, unit non-response, social desirability and social presence are evaluated. In addition, we assess response times as well as the social setting and the location in which the survey was filled in.